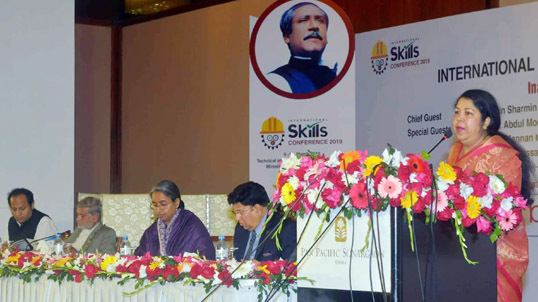 Jatiya Sangsad (JS) Speaker Dr Shirin Sharmin Chaudhury on Saturday said there is no alternative to developing skilled manpower to face the growing global challenges. “If the country’s people could be built as skilled manpower, it would be possible to ensure inclusive development in Dhaka,” she told a conference at Sonargaon Hotel in the capital. Technical and Madrasah Education Division under the Education Ministry arranged the International Skills Conference-2019. Speaking as the chief guest, Dr Shirin stressed the need for developing the country’s people citizen as skilled manpower to establish a poverty- and hunger-free Bangladesh by attaining the Sustainable Development Goals (SDGs). Noting that Bangladesh is moving forward under the guidance of Prime Minister Sheikh Hasina, she said once skilled workforce is created, the poverty rate will decline. “Meanwhile, the rate of poverty declined to 22 percent from 40 percent in the last one decade,” she added. The speaker said along with the general education, technical and vocational education is playing an important role in creating skilled manpower in the country. Chaired by education minister Dr Dipu Moni, the conference was addressed, among others, by foreign minister Dr AK Abdul Momen, planning minister MA Mannan, deputy minister for education Mohibul Hassan Chowdhury and Technical and Madrasah Education Division secretary Md Alamgir.